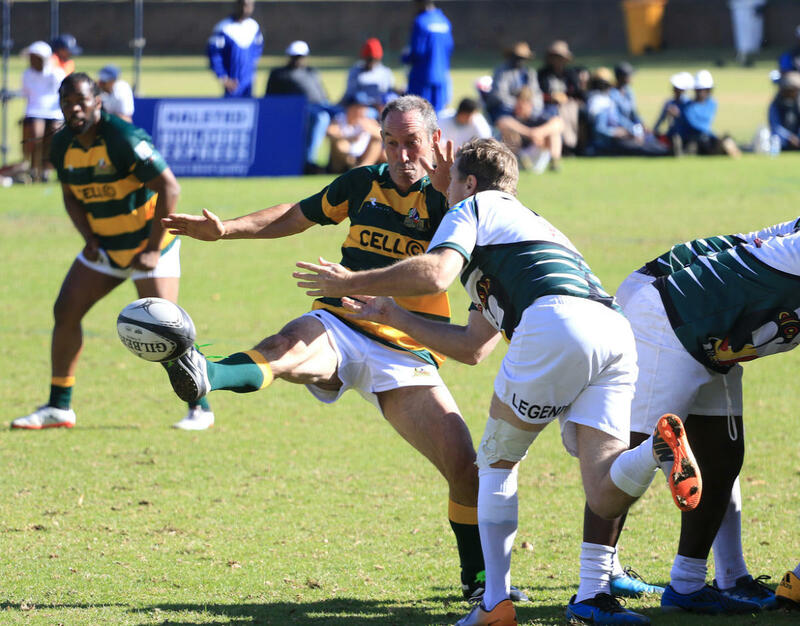 The SA Rugby Legends 2018 tour to Zimbabwe was yet another success with the SA Legends pulling off a 57 – 10 victory over the Zimbabwe Rugby Legends. An annual event which sees the two neighbours visit one another, it was the turn of the SA Legends to take the trip across the Limpopo to Bulawayo, made possible this year by sponsors Ethekweni Refractories and T3 Drilling. After a quick training session on the Friday afternoon the SA Legends were guests at a dinner hosted by The Hartsfield Trust at the Bulawayo Club. Prior to the match on the Saturday the Legends hosted a coaching clinic for an enthusiastic group of learners from the local school run by Legends Coach Ian McIntosh. Played at Falcon College in Esigodini outside Bulawayo, the match was a curtain raiser to a class school clash between Falcon College and Peterhouse, former school of Springbok Centurion Tendai “Beast” Mtawarira. Helmar Breytenbach was first across the line for the SA team, with a conversion by captain Henno Mentz to take them to an early 7 – 0 lead. Zimbabwe were awarded a penalty to make it 7 – 3. Jacques Muller followed with another try, Anton Vlok converted with a try soon thereafter from Marc Watson, the South Africans 19 – 3 ahead. Just before the half time whilst, after a nifty kick though from scrumhalf Hentie Martens, Anton Vlok went over and Henno Mentz converted, to go into the break 26 – 3. Just after the break, the Legends added more points, Henno Mentz, breaking away from a lineout move, passing the ball on the inside to Sam Gerber who dotted down under the poles with Anton Vlok adding 2 with the conversion. 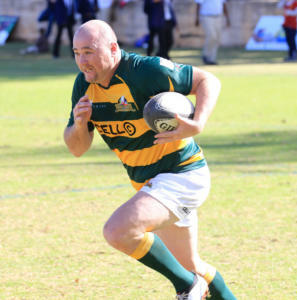 Former Italian international, Quintin Geldenhuys added another try to put the SA Legends 38 – 3 ahead. 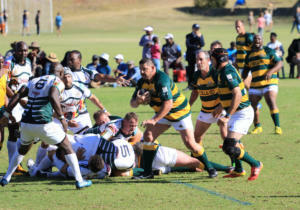 A break in play saw the Zimbabweans score a successfully converted try, taking the score to 38 – 10. No Legends match is complete without Henno Mentz crossing the chalk, and he successfully converted it, putting the visitors 45 – 10 ahead. 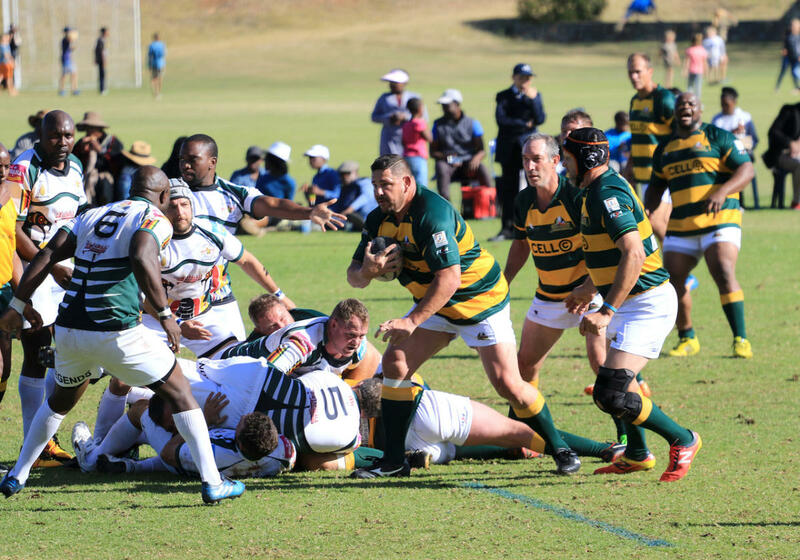 The try’s continued with Roedolf van der Westhuizen scoring and to end the match, Johan Prins went over and converted his own try, to claim the spoils for the South Africans 57 -10. As it was a curtain raiser to the school game, the Legends supported from the sidelines impressed with the high standard of rugby offered by both schools, but, more importantly, the spirit in which the game was played and the camaraderie between the teams and players. The Legends were wonderfully hosted that evening at Falcon College with many locals staying on to celebrate the school’s impressive victory over Peterhouse. A big thank you to the Zimbabwean Legends in particular Greg Friend and his organizing committee, Falcon College and The Bulawayo Club for their wonderful hospitality and our tour sponsors Ethekweni Refractories and T3 Drilling for making the tour possible.